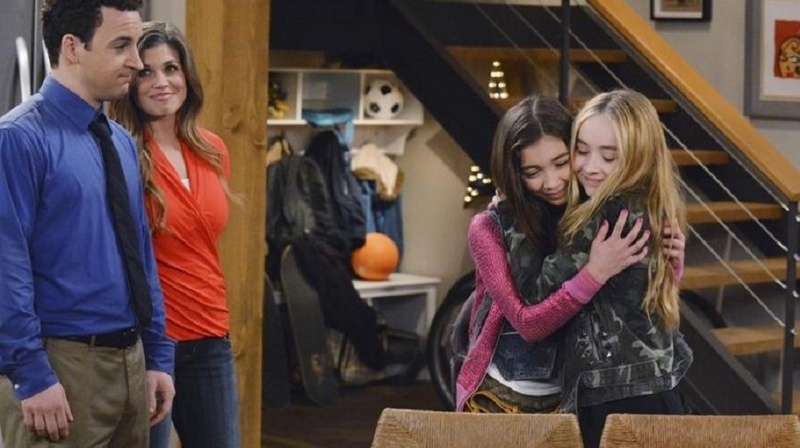 We’ve watched the brand-new teaser for Girl Meets World‘s weeklong Season 2 premiere, and we think we’ve caught all the most exciting moments. Forgive us if something slipped passed our corneas: Disney packed five nights of episodes (two and a half hours of show time) into one 60-second commercial. And it’s so good. So, so good! If this is just how they’re kicking off the new Girl Meets World season, we can’t wait to see what’s ahead for the rest of the summer. The only time we’ve seen Feeny on Girl Meets World was once last season when he showed up in the subway on a billboard and (if memory serves) winked at his former student, Cory. We legitimately thought they were going to play him off as a dead guy. Clearly that’s not the case, however, and we can’t wait to see how it all plays out. 2) Why are they in his backyard? Why? Will this be some lesson on their individuality? Is it all just a part of someone’s strange dream? We can’t wait to find out. What did he do? If he breaks Riley’s heart by talking to that catty, shallow girl in the back corner who tried to manipulate him once already last season, we are so over rooting for Lucas. A new grade means new classes. That means Riley and Maya are probably no longer in Cory’s class this year. We’ll still see Mr. Mathews at home, and probably in the hallway. And, of course, this is infinitely more believable than if they were in his class year after year. And yet… we wish they were. Uh… what? There’s a quick clip of Maya showing off a fancy ring to Riley. It could all just be part of a strange joke or some other silliness. However, we think it’d be awesome if it has a little bit of meaning. Last season, we watched as Riley and her dad carefully plotted to put Shawn into Maya’s life as a father figure. Maybe he’ll get closer to Maya’s mom, propose and get Maya some sort of silly ring to let her know he’s there for her? OK, fine. That seems more like something worthy of a locket that a crazy ring. But we’re just so confused. From the first shot of Will Friedle in his crazy Mr. Squirrels getup to the cleaned up, more Eric-like version we saw two shots later, we were basically just squealing. Though, the “my brother” thing definitely got us teary-eyed, as well. Those two are just too precious for words. Check out the whole video here and feel free to speculate on what’s ahead in the comments below.